I really object to companies taking normal English language words and trademarking them, its a really petty landgrab mentality. So I am delighted the judge in the ‘App Store’ saga appears to share the same view. Now they just need to charge back the full cost to the clowns who launched the action and common sense might be encouraged in future. And we get to keep all our words. I don’t mind sticking the boot in when someone needs it, but I think its only fair to recognise good sense too. So well done the EU for giving Amazon the slap they needed. I’m all for patent protection for genuine invention, but I’m not a fan of software patents, business process patents, or silly walk patents, or patenting the bleedin’ obvious. Good job I’m in Europe then. I’ll stop now before this goes rantward. What do you think about software patents and the monumental legal feeding frenzy they have created in the US? good thing? or bad thing? Yesterday was a very very special day at Murphy towers. 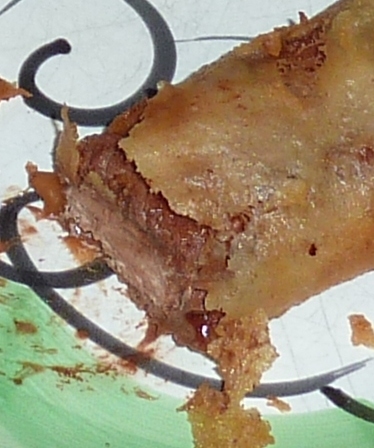 We had our first battered Mars bar! I have been desperate to try this particular delicacy for many many years, ever since I discovered that it was not an urban legend in fact (well rural legend really – the main chipper that allegedly sells them is in the lakes). Anyway, V nice, highly recommended. Sorry the picture is so crap I was fighting the kids off with one hand, whilst trying set up my camera with the other, (and eat the bit that is missing), which was damn hot! What’s your favourite fried delight?